Made at L'Abominable, the artist-run film lab in La Courneuve, France, Brûle la mer uses co-director Maki Berchache’s own experience of leaving Tunisia after the 2011 Jasmine Revolution as an entry point for a collective narrative about the harragas, North African migrants seeking refuge and a new, “better” life in Europe. “The film is a poetic quest which combines materiality (in the strictest sense of that which is material life) and abstraction: the experience of rupture, of reversal. The images should render perceptible the connection between a country left behind and the country of dreams, and then, the reversal which slowly takes hold, of how the country of dreams becomes the country left behind” (Nathalie Nambot). 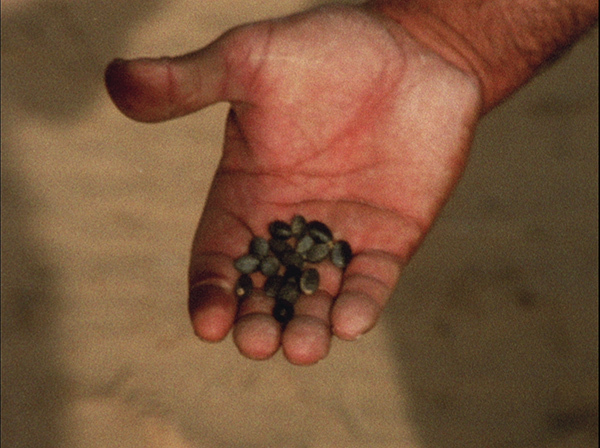 Image: "Olives", courtesy of the artists.